RadPdfViewer enables you to open documents and show the bookmarks they contain in a bookmarks panel. Bookmarks or Outlines are a tree-structured hierarchy that the reader presents as a visual table of contents separated from the actual content as a side panel. The Bookmark items allow users, by interacting with them, to navigate through parts of the document and/or invoke different actions. The Bookmarks (Outlines) functionality is available as of R3 2018 SP1. In RadPdfViewer, the bookmarks are shown via using a RadTreeView simulating a navigation pane. This is a control representing an area that can display different navigation panels, including the Bookmarks of the PDF document which serve as a table of contents. The bookmarks are displayed in the same container in which you can find the thumbnails. The ThumbnailListWidth property controls the width of the panel that hosts the thumbnails and the bookmarks. Title - gets or set the title of the bookmark item. Destination - gets or sets the Telerik.Windows.Documents.Fixed.Model.Navigation.Destination associated with the bookmark. IsExpanded - gets or sets a value indicating whether the bookmark is expanded. 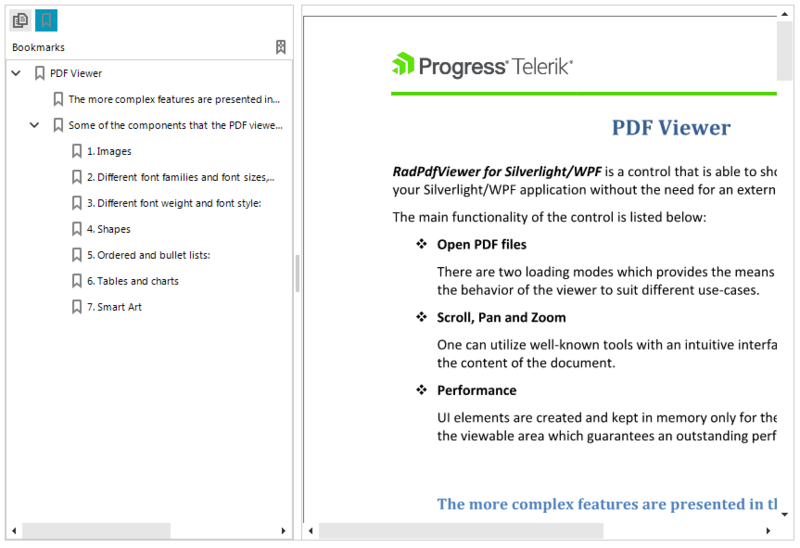 ShowBookmarks - shows the Pdf document's bookmarks. GetCurrentBookmark - gets the nearest bookmark from the Pdf document's. SyncCurrentBookmark - syncs the nearest bookmark from the Pdf document's to the tree.